Most of us wouldn’t think twice before feeding our dogs a portion of our food. It’s tough to not fall for those big brown eyes staring at us longingly anticipating a reward. Your doggie definitely deserves a reward, a treat for loving you unconditionally and making your life so much more happier, but rewarding your pooch with human food is a complete no-no. Several foods that are perfectly safe for you can be downright dangerous to your dog. Take a look at some of the foods that you should never feed your dog. Onion and Garlic: Whether raw, cooked or in a powdered form, onion and garlic can cause anemia in dogs, especially when consumed in a large quantities at once or eaten in small amounts over a regular period of time. The symptoms of onion induced anemia in dogs include weakness, vomiting, dullness, lack of interest in food and breathlessness. Chocolate: Chocolate contains theobromine, a stimulant and diuretic that affects our dog’s cardiovascular system and the central nervous system. Eating chocolate can cause vomiting, diarrhea, abnormal heart rhythm, tremors, seizures, and even death in dogs. Though, theobromine is present in all chocolates its level is higher in dark chocolates. Coffee/Tea/Caffeine: When consumed in large quantities, caffeine can be fatal for dogs. Symptoms of caffeine poisoning include rapid breathing, restlessness, heart palpitations, muscle tremors, and bleeding. Alcohol: Alcohol is unsafe for us and our dogs. But, it has more damaging effects on our dogs than us. Consumption of just a small amount can cause vomiting, diarrhoea, breathing difficulty, central nervous system depression, coma, even death. The smaller your dog, the greater the effect of the alcohol on him/her. Avocados: Eating the avocado flesh or peel can cause mild stomach upset in dogs and cats. But, the primary danger of avocados to dogs and cats concerns the possibility of them swallowing its large pit. Ingestion of the avocado pit can lead to the obstruction of oesophagus, stomach or intestinal tract, a situation that’s quite serious and requires immediate vet care. Raisins and Grapes: Grapes and raisins can cause kidney failure in dogs. Signs of grape poisoning include repeated vomiting, lethargy and depression. 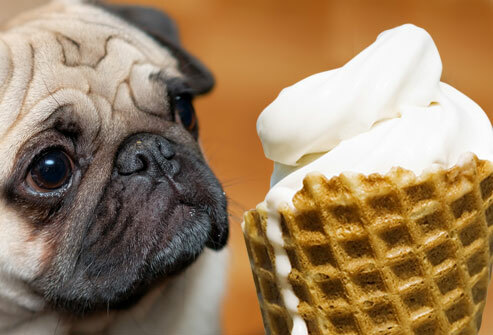 Milk and Milk Products: Do you often share your ice cream with your dog? Most of the dogs are lactose intolerant and consumption of milk products can cause diarrhea, nausea, and food allergies. Raw Eggs: Raw eggs may cause food poisoning from bacteria such as Salmonella and E. coli. Raw eggs also contain the enzyme avidin, which interferes with the absorption of a particular B vitamin in dogs. This can result in skin problems such as dermatitis and hair loss. Raw Fish: Certain kinds of fish such as salmon, shad, or trout contain a parasite that causes food poisoning. The first signs of poisoning from eating raw fish are vomiting, fever, and swollen lymph nodes. Feeding your dog cooked fish is therefore a better option. Salt: It’s not a good idea to feed your dog chips and other salty foods. Eating too much salt can cause frequent urination, vomiting, diarrhea, elevated body temperature, and seizures in dogs. Many other items found in our kitchen shelves such as spices and baking powder can harm our dogs. So, make sure you keep these food items out of your dogs’ reach. This would prevent your pooch from accidentally consuming any of these.